A device used for draining liquid from food. It consists of a bowl constructed of metal or plastic that is covered with a series of holes through which the liquid can drain. The bowl usually has two handles and it may also contain a base or legs. 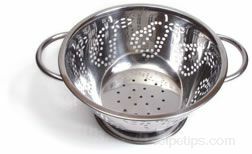 Colanders are useful for draining water from boiled foods such as larger pasta shapes and potatoes. They are also useful for cleaning bunches of fruits and vegetables, allowing water to be drained as it is washed over the food.